Four and a half months! I apologize, but I’ve been in my own head since I met my biological father. Thoughts and emotions have been swirling around in my noggin . . . just trying to make sense of it all. It’s all so simple, but also complicated! Mission accomplished . . . but it’s just the beginning of something new. The trip up to meet Jackson could not have gone better. We met, we hugged, we talked for hours. We cooked together, had a drink or two, shared stories, pictures and laughter. And I met my half-sister, Megan, too. Megan admitted that she was reluctant when I first contacted her. I know she was being protective of her father. But she said that when she finally realized I was actually coming, she started to get excited and was looking forward to meeting me. We were able to spend some time together, as well, and talk about life over a glass of wine or two. And what of physical similarities? 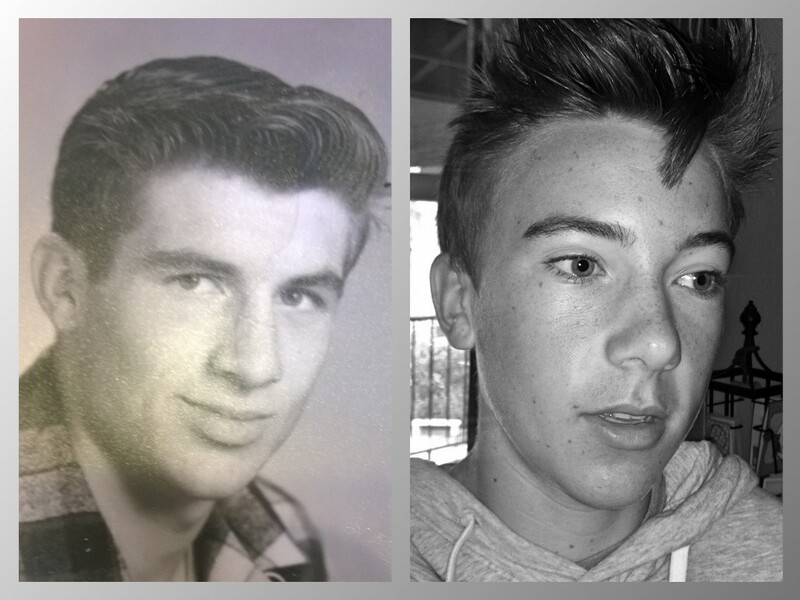 Even before I met Jackson, through photos, I could see similarities between Jackson and my son, Garrett. But try as I may, I could not see any physical similarities between myself and Jackson. It’s something adoptees are obsessed with. Even when I met him, I didn’t have an “Aha!” moment. He does have a full beard, so I couldn’t really see the details of his facial features. I gave up looking for the physical similarities. That is, until I got home and analyzed some old photos. Jackson believes he’s about 18 in this photo. I’m 17. Spitting image is the usual modern form of the idiom meaning exact likeness, duplicate, or counterpart. The original phrase, however, is spit and image, perhaps inspired by the Biblical God‘s use of spit and mud to create Adam in his image. There is no evidence that the origin of the phrase goes back to Biblical times, but its usage has been traced back to the 17th century in England. It was used to refer to someone who is so similar to another as to appear to have been spat out of his mouth. Of course, spitting image has been far more common than spit and image for over a century, but I prefer the phrase spit and image. After all, we found each other by spitting into test tubes. I’m honored that Secret Sons & Daughters has shared part of my story. DNA testing for adoptees is most definitely “trending” these days. I found answers and information that I didn’t expect . . . you might, too. I’ve neglected this blog. I apologize. “Real life” has kind of taken over. Wait . . . that’s not accurate. Or fair. It’s all real. What I mean is, some things going on in my life have taken a priority over other things. I haven’t been able to keep you properly updated on everything that’s been going on. Nothing earth shattering . . . but that’s okay. After all, it’s just real life. Real life includes it all: your health and the health of your family members, your marriage (or your relationship with your significant other), family, friends, kids in school, kids in sports, adult kids moving back home, aging parents that need help more and more, career, hobbies, etc. At any moment, the juggling act to keep it all going can be thrown out of whack. Throw in a search for biological family members and all of the emotional ups and downs that go with it. Something has to give. Needless to say, my real life has gotten a little crazy lately. I know I don’t need to explain it to you because I know that each and every one of you have experienced some sort of personal crisis or something that seemed to suddenly throw your life into chaos or elevated stress mode. So I apologize for the lag in between posts. Enough said about that. There is good news. I’m happy to report that Jackson and I are communicating again. Apparently the communication “breakdown” was caused by a new e-mail address and a problem with e-mail servers not accepting mail from certain domains. We’ve figured it out and all is well. He’s still the open-hearted, sweet man he always has been. We even video chatted! It was totally by accident (my son just pushed the button and handed me the phone and there he was!) and I was totally unprepared, but it was really fantastic to talk to him “face-to-face.” He still has questions and still wants to know more about Margaret. I wish I knew more. He’s written a few letters to Margaret, but hasn’t sent any. He’d rather talk to her in person (he’s brave). I told him I’d help him out however I can. Who knows . . . maybe a road trip is in our future! Okay, that’s a long shot. I still haven’t even met Jackson. I hope to soon. Jackson does want to go ahead and re-submit DNA to another company to confirm our father/daughter match. I’m fine with that, so hopefully we’ll be doing that soon. I think I will also submit samples from both of my sons at the same time. Perhaps a double dose of an instant grandson matches might convince him beyond a reasonable doubt that he is my biological father. If you’ll recall, a few months ago when Jackson suggested sending in another sample he thought it would also be a good idea to have his other daughter submit a sample, too. I thought that would be cool–a sister. But apparently she’s not interested. I don’t know exactly how she feels about my arrival on the scene, but she is not interested in sending in a DNA sample to help her father out. It’s also apparent that she isn’t interested in developing a relationship with her biological half-sister. At least not yet. That’s okay . . . remember Richard Hill’s story? These things take time. And I know from past experience you just can’t rush (or force) these things. Thank you, Science and Technology. 23andMe gave me a genetically “clean” bill of health. Information presented included risk for certain diseases, carrier status, drug response, genetic traits and “health labs.” 23andMe detected a couple of genes that indicated an elevated risk for non-life threatening conditions (psoriasis, restless leg syndrome). As for the possibility of inherited conditions, my test results detected no mutations or gene variants that might indicate any of the serious inherited conditions screened by 23andMe. Of course, this was before 23andMe suspended their health-related genetic testing to comply with the U.S. Food and Drug Administration’s directive. Lucky me. After I received the health results, I played around with the ancestry section of the site. I was fascinated to find out that I was British and Irish. I didn’t figure that! Given my propensity for arguing, raising my voice in exciting situations, and talking with my hands (flailing uncontrollably while talking, actually), I figured there would be a bit of Italian in me. But no. Oh well . . . I was enchanted with being British and Irish. Turns out I was visiting my ancestors’ homeland when I spent that year abroad in college. Cheers! My adoptive mother would have loved to have known that. And with the Irish bit, I secretly imagine that I am related to Bono. Don’t laugh! My past, including my heritage and ancestry, had always been something I could play with in my imagination. Adoptees do that a lot. 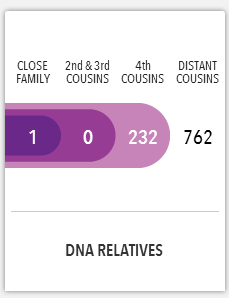 I don’t know why I never thought to look at the DNA Relatives section of the site. I knew who my biological mother was. I knew that she didn’t have any other children. What were the odds that I’d find anything or anyone meaningful through a DNA match? First, I didn’t imagine that my birthfather was actually looking for me (most likely he was not aware of my existence). And given his age (early 70’s), I didn’t think he’d be spitting into a tube getting in touch with his genes. I didn’t venture to the DNA Relatives section. Through our shared DNA, 23andMe has identified us as relatives. Our predicted relationship is 4th Cousin, with a likely range of 3rd to 6th Cousin. Would you like to explore our relationship? 4th cousin (maybe even 6th)? Whoop de doo. I guess because of the fact that I had no blood relatives that I actually knew, except for my own boys, a 4th cousin did not rouse any sort of curiosity in me. Even if he was related to me on my paternal side, how would I know? A potential match would request lineage information via a list of surnames. A potential match with a common surname could help someone putting together a family tree fill in the blanks. I’m afraid my blanks go much deeper than that. I could not help anyone. I don’t have any surnames. I ignored the message. But then I got a few more. They were all pretty much the same . . . . 3rd to 6th Cousin, 4th to Distant Cousin, etc. I finally decided to go online at 23andMe and check out the DNA Relatives. I knew that I could “shut off” the notifications if I wanted to, but I have to admit I was a little curious to see what kind of matches I had and how 23andMe presented the information. 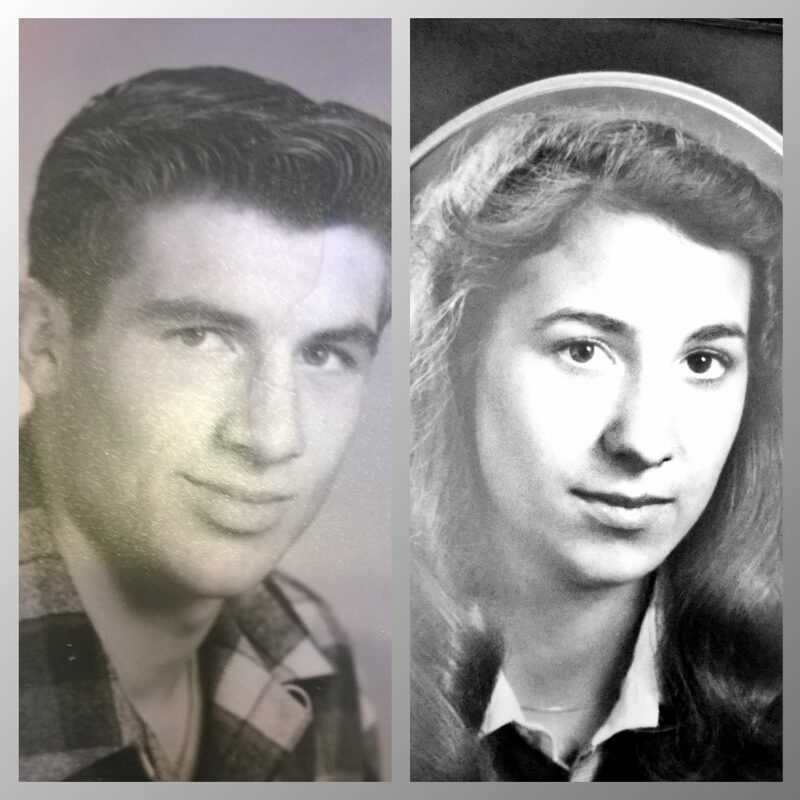 762 potential relatives? Sheesh! What does one even do with this kind of information. Distant cousins? Who even cares? Okay, maybe a lot of people do care about distant cousins–it’s a way to find common ancestors and build your family tree. But I don’t have a family tree. Or even a bush. Or a weed. Then I saw it. 1 CLOSE FAMILY. What? Who? I clicked on it. Before 23andMe would reveal any details, a warning popped up. I had to confirm that I really, really wanted the information. This was not a game. 23andMe asks for two layers of consent before it shows family relationships. First, users are given the chance to turn off the “relative finder” function, which shows relations as close as second cousins. Once you’ve opted in, if 23andMe has found any close relatives (closer than a second cousin), a warning is presented to the user via popup that explains how this “new” evidence of a close family relationship can be unexpected and even upsetting in some cases. Upsetting? Been there. Done that (with Margaret). You may learn information about yourself that you do not anticipate. Such information may provoke strong emotion. Thanks, 23andMe. Now I’m scared. But I clicked “proceed” anyway. What the hell? My biological father? 23andMe found my biological father when no one else in the entire world (except for Margaret) knew who he was? Boy, howdy, this is not a game. Or is it? I felt like I had won the lottery. I just needed someone to confirm the ticket. I am contacting you because 23andMe has identified you as a relative of mine because of our shared DNA. 23andMe has predicted, through our DNA “match,” that you are my biological father. You won’t recognize my name, because I was adopted and bear the name of my adoptive parents. However, my birth mother’s name is Margaret Michaels. I hope that the name Margaret Michaels is familiar to you, although it was 50 years ago and I understand that it was a difficult time for both of you. I hope that you will respond to my message and that you are interested in exploring our relationship. I look forward to hearing from you! Laureen Pittman (original birth certificate reads: “Baby Girl Michaels”). Crazy, right? But it can happen. 23andMe even said so. It has happened before. The stories I found amazed me. Some scared me. Some were happy endings, or new beginnings. Sometimes the results were, indeed, unexpected. This story is one of my favorites: Whoops. How DNA Site 23andMe Outed Parents Who Gave Their Baby Up For Adoption. And this one: When Family Ties Turn Into Knots. I guess I liked the stories that tore open the carefully crafted lies revealed life changing information and brought enlightenment to people seeking information. Science and technology have this incredible way of uncovering secrets. I waited for my secrets to be revealed.